Create a warm holiday welcome this season with the Unlit Gold Glitter Cedar and Mixed Pine Garland. This garland is beautifully trimmed with 10 burgundy fabric poinsettias, a stunning red bow centerpiece and a rustic sprinkling of pinecones. Red berry accents and gold glitter cedar sprigs add the finishing touch. 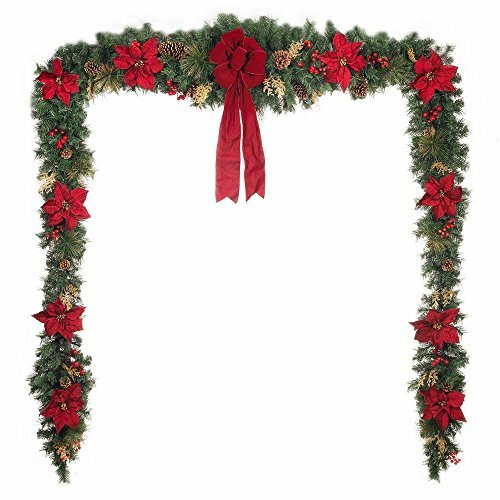 Measuring 17 ft. long, it makes a striking decoration above your entryway, draped along the fireplace mantel or even framing your holiday buffet table. You can also add your own light string to make the whole display sparkle.